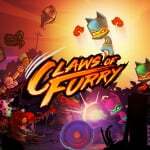 You had us at "vigilante ninja-cats"
Indie developer Terahard has announced that its beat 'em up, co-op action game Claws of Furry will be scratching up your Switch on 4th September. The game allows up to four players to take on the roles of vigilante ninja-cats on a mission to rescue their master from the evil claws of an unknown boss. Players can punch, scratch, and claw their way through fifty levels, all inside a game made up of four distinct environments with their own sets of enemies. Does this look like a purr-fect game for your Switch wishlist? Let us know if you'll be grabbing this one with a comment below. Its title reminds me of Bubsy - Claws Encounter of the Furred Kind. Great name terrible game! seems kind of interesting but seems kind of short at the same time. I think this was showcased here already. I am reminded that I didn't like the no-arms approach here. It doesn't seem to work very well. Castle Crashers needs to come to Switch. Claws of furry were the games which have played by the all big celebrity names in the world of the showbiz for the good considerations. From Septembers by the orbiters have bestdissertation in the all celebrity also for the good environment have meant.